I used to use Cactus V6 and V6 II recently without any concern. V6 II is great to bring HSS to my X-T1. With the V6 (1st version), I have no concern. It works immediately and smoothly. No problem of battery or things like that. I have a real some strange behaviour ... when a RF60 and the V6 II are both communicating together (sometime it works ) if HSS is OFF, I guet the picture ... But if HSS is ON, then the flash comes few (3 or 4) seconds after the shoot has been done ... Strange, no ??? However we noticed similar instability on the previous firmware version on the RF60. So we released the latest version, 204. Please update it on your RF60 and see if it cures the problems you encountered. Try updating the RF60 again to the 2.04. We had a glitch on the first upload and fixed it after a day or two. It appears the V6 II has slightly different RF range than the original V6. So you can stick to SHORT range on the V6 II. FYI we tested SHORT could trigger up to 100m - but on an open field. Though officially we recommend using SHORT for distances of 10 to 3 meters. 1. Auto detect: On the V6II which attached on top of the camera, half-press the camera shutter while switching on the V6II in to TX mode. 2. Using Manual selection. Select the camera system in the MENU under CAMERA and FLASH SETUP. Any help would be appreciated. I also started having a problem getting the V6II and RF60 to HSS on my D800. Was getting banding over 1/320. Will try to assess more today with regard to the Nikon. But the delayed flash on the X-T10 is really baffling. I already watched that tutorial. I have done all the setup correctly for the Fuji system. V6II is in fact detecting the Fuji camera. When "Forced HSS" is "ON" I get a delayed flash after shutter release. When "Forced HSS" is "OFF" I get normal flash but banding at 1/250 and above. With the Nikon D800, I am also confirming the V6II is detecting the camera as "NIKON". However there is no "Forced HSS" option, only "Normal HSS" in "Functions" I have been unable to get HSS to work with this camera also. I get banding at 1/320 and above. And this camera has HSS native! I have made sure 1/320FP (HSS) is selected in D800 Camera Body. Forced HSS is for Fujifilm camera only. HSS is automatic for supported Nikon camera. I doubt D800 is not capable for HSS. In case you have a Nikon flash, you may attach to the Nikon camera and see whether it can shoot in HSS. If the camera doesn't support HSS, so the HSS cannot be done with V6II. What is the version number of your RF60 firmware? Keep "Next" pressed when you turn on the RF60 to check it. Also, don't try to manually set HSS on the RF60 but leave the "Auto HSS" option on "ON". Nikon D800 DOES support HSS native. I have used HSS with my SB800 speedlights for years. As stated in earlier post I have 204 RF60 Firmware intalled...have tried ALL different firmwares also, now back on 204. V6II is using 1.1.004. "Auto HSS" is "ON" on the RF60. Still no HSS for D800 when Camera supports HSS native, and only get delayed flash when "Forced HSS" is "ON" and "Learn HSS" has been completed for Fujifilm X-T10. @focalcraft: Yeah, I noticed the firmware version you stated earlier on, but I thought it is worth checking that an update actually worked. Do you only have one V6II unit? If you have a different one, perhaps try that on your D800. Someone else swapped their V6II units and then succeeded in getting HSS from their D800. Apparently, there can be hot-shoe connection issues, even if the V6II recognises the camera in the beginning. 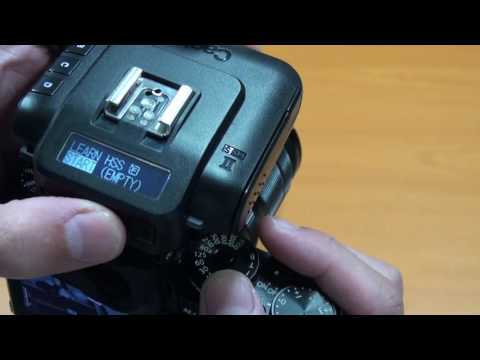 @nicphoto: Does your V6II recognise the D800 when it is turned on? Remember to repeatedly tap the shutter release button while turning the V6II on the D800. The V6II must confirm the recognition of the camera with an "N" symbol, otherwise, you won't get HSS from your D800. You can also try to manually set the camera system to "Nikon" but then you won't get a confirmation that the V6II can communicate with your D800. If the V6II fails to change power levels on the RF60, try using the "SHORT" option for the "WORK RANGE" setting. Perhaps the V6II is too close to the RF60 for the "LONG" setting to work. Also make sure that the radio channels match up on the V6II and RF60. For further trouble shooting, it would be useful to hear what is working and what is not (e.g., test button on the V6II can or cannot fire the RF60). I only own one V6II unit and the RF60. NOthing so far has worked to enable HSS. Also no one has addressed the issue of the delayed flash with "Forced HSS" "ON" with the Fujifilm X-T10. I have updated all firmware on both units multiple times and confirmed the firmware version with the unit display screens. Should I just send these back to B&H or what? No one is offering a solution. Hello @focalcraft, sorry for the delay in replying. I only own one V6II unit and the RF60. NOthing so far has worked to enable HSS. Just to be sure, are you able to have the V6 II to auto-detect the D800 as Nikon camera? You shall see a N camera icon on the V6 II LCD. Half-press camera shutter button as you switch on the V6 II to TX mode. After startup, you can pull up the Status screen by pressing the MENU button and scrolling the Adjustment Dial. ...Also no one has addressed the issue of the delayed flash with "Forced HSS" "ON" with the Fujifilm X-T10. I have updated all firmware on both units multiple times and confirmed the firmware version with the unit display screens. Redo the LEARN HSS process. I experienced that before too, on the X-T1. Somehow on the first shot it wasn't able to learn the timing correctly, despite it says learning completes. Too bad we don't have a Nikon D800 to test. But during our beta testing phase, we have at least 3 photographers who shoots on a D800 and no issues were reported. Yes, the V6II is auto detecting the Nikon Camera the "N" is displayed in the camera box. I have tried re-learn the HSS on the X-T10 20 times now and still get delayed flash when "Forced HSS" is "ON"
Update again the beta version, the latest firmware is 1.0.109. But the current public latest version 1.1.004 firmware should work, since Fujifilm has yet to update camera firmware on the X-T10. (Or have they?). For the D800, I will ask around and see if others using the same camera have any issues. Fuji hasn't updated X-T10 firmware since v1.21 released June 2016. I located the beta 1.0.109 firmware and installed it but there was no change in the function with the D800 and now there is not even delayed HSS flash anymore with X-T10. No flash at all when "Forced HSS" is "ON" and the "Learn" process completed. Still no HSS, beta firmware was no help. Do you also own a X-Pro2 and X-T2? The Beta firmware (1.0.109) is only for X-Pro2 on v2.0 and the new X-T2. If not, please stick to firmware version 1.1.004 for your X-T10. I believe it's been working with the X-T10 as seen in recent review on DPS. I think Fujifilm should update the X-T10 soon, when their EF-X500 is out? Only use the new firmware (that we will soon release to public) when you get a new firmware on the X-T10. Nikon D800 - I've been in a meeting all morning so didn't get to ask around. Will do now. Firmware 1.1.004 should work no problem. Have you tried setting the camera to single shot? What are the other setings you've got on your camera? EDIT: one of our beta tester said he was able to shoot 1/8,000s no problem. And that was on 1.1.004. I do not own an XPro2 9I have restored the V6ii to the 1.1.004 firmware. I have re-confirm all D800 settings are appropriate for Nikon AutoFP High Speed Sync. Still getting exposure banding at 1/320 and higher. Still delayed flash with X-T10 and "Forced HSS" "On". I am beginning to suspect the RF60 may be the problem as it will not achieve HSS when on the Hotshoe of the either D800 or X-T10 with RF60 in "L" mode neither with "HSS" on or off on the RF60. Please advise. I am close to throwing in the towel. I feel as though I am paying to beta test your product for you. Please note that the beta firmware was only for people with X-T2, and later X-Pro2 users who upgraded to v2.0 camera firmware. They downloaded it knowing that it's only a beta version and they were willing to help us find bugs and or compatibility issues. People with X-T10 like yourself do not need to even touch the beta firmware for the X-T2. It's working just fine on 1.1.004. Please continue to use it. The RF60 is a manual flash at heart - note that it uses a single pin hot shoe. So it is normal for it to not support HSS. Please stick to 1.1.004 for now. This firmware version works with both your X-T10 and D800. For the RF60, use firmware vesion 2.04. By default, "AU HSS" is turned ON already, meaning a V6 II can trigger it and do HSS. As soon as we get our hands on a X-T10, we will study its reliability on the newer firmware. AU HSS can not be manually activated/desactivated in Slave Mode on RF60 (only on Local and Master mode). So do you mean it is by default ? So why the HSS is not displayed ? I am using 204 firmware on RF60 and 1.1.004 on the V6II. I am still getting the delayed flash with "Forced HSS" on the X-T10. It should either be a setup error or a problem with your particular V6 II unit(s). The X-T10 has been tested by others to be working fine with HSS. The most recent report was from a review posted on DPS. While for the NIkon D800. It has also been tested by others to be compatible, two of our beta testers, one with the D800 and the other a D800e. Try doing a factory reset and start from scratch. Leave all the default settings such as auto-detect and let the V6 II do its thing - identifying the camera system. If the problem persists, contact the dealer you purchased your V6 II from and have the units checked. You may also return them directly to us if you wish to.